loyal as a hound dog." Doug Jones, bless him, plays del Toro's monsters. It's OK. Guillermo loves his monsters and in Hellboy II: The Golden Army, there are a great many to love. The word's a bit loaded – a monster is invariably 'bad'. But in the second finest scene of his visually rich, stone-fisted sequel, one particular monster evokes our pity and then its demise provokes astonishment. I whispered to my son "That's beautiful," seconds before Abe Sapien mutters the same line on screen. How often does Hollywood elicit that reaction? Beauty is not the first thing to expect from a monster movie – unless you are Guillermo del Toro. For those of you who stare at the Hellboy 2 posters and mutter "What the hell is that? ", I'll offer a little clarification. In the first movie, John Hurt rescues a demonic baby creature from another hellish dimension opened by Rasputin (stay with me) during the Second World War. Raised as a human child while being resolutely not (the sawn off horns, lobster skin, tattoos, and a stone arm and tail are the giveaways), Hellboy grows up, develops a fondness for cats, cigars and TV and takes his moral code from his adoptive father. He's indoctrinated into a secret organisation battling other manifestations of magical beings when things get seriously and darkly odd. Let's not forget that Hellboy grows up to look like Ron Perlman, perhaps most famous for his 'Beast' from the 80s' TV show Beauty and the Beast. He's also a favourite of director del Toro and an actor who manages subtle blessed with a body that should not be capable of it. It's curious that the poster tag-line "Believe it or not, he's the good guy," is aggressively going for a new audience as fans of the first know he's the good guy. Duh. The first movie didn't go stratospheric despite the reputation the original has gained since its 2004 release but the sequel is out-performing it at the box office. Slarek's review (here) faithfully reflects my own point of view and the central blockbuster expectations (and therefore clichés) are in place in the sequel too. But it's to del Toro's credit that he can play in the multi-dollared mogul sandpit just as happily as in his low-peso, labyrinthine own. That's not to dismiss Hellboy 2 out of stone hand because if you are asked to deliver standard summer fare, there's no reason not to slip in a few golden nuggets if the clichés of structure and expectation can stand the weight. They can. Hellboy 2 breaks no new ground (there is ground breaking in the movie but of the literal kind) but it is enjoyable for the obvious care and craft that's gone into it. The effects and make up are both top grade, state of the art. When the baby is thrown into the air for a reload I barked with joy. "Trust me, kid..." Lovely. When someone who's been exposed to so many movie tricks in his lifetime (myself) cannot tell the difference between a prosthetic and CG enhancement, it's time for me to finally say that we can now appreciate images as images and not dismiss their creation as just so much mouse work, often the sina qua non of big budget summer cinema. But I really could do well without more robots slugging it out. I mean the work that goes into their creation, hats off to the hundreds who make it all look so good but more mechanical mayhem? I don't and can't care. I can happily wait an eternity for Transformers 2. There's an intimate scene – which could have been eye wateringly embarrassing – which the two leads and del Toro pull off with such style that I had a grin plastered to my face throughout. With the exception of Perlman's expressive CG rendered tail, the scene involved no obvious special effects – just great acting from underneath pounds of prosthetic make up. I will say only two words about this genuinely lovely moment (Barry and Manilow) and let you enjoy it for the surprise it will be. Content to let the action speak for itself, del Toro also delves a little deeper with both leading 'men'. Both 'Red' Hellboy and 'Blue' Abe get their love stories and it's credit to all involved that they are somewhat affecting. Again, this isn't Bergman, it's typical summer studio fare but the weightier emotions are there if not fully explored. It's Hellboy after all and so it's violent physical confrontation and CG spectacle that pulls in the punters (or so it's believed) and not overt sentimentality. Of course the actual plot is a throwaway. A netherworld prince, deeply mistrusting of human nature, seeks the three parts of a crown that when united will bring forth an indestructible army of golden automata; end of the world stuff of course, as it always has to be. del Toro's cognitive proclivities aside (and how much fun is it to start a whole paragraph with a lowercase letter and have it still be correct? ), Hellboy 2 stands or falls on the delivery of spectacle. In this regard the movie is a triumph of imagination. 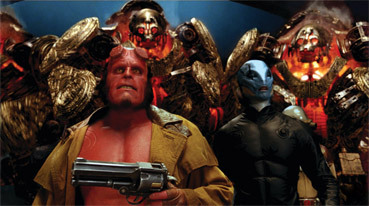 The action is nothing we've not seen before though I did enjoy the delicious romp through Hellboy's young mind as he visualises the 'fairy' story of the Golden Army via his love for the 50s puppet American TV star, Howdy Dowdy. There was something quite magical about that, not being anchored in Middle Earth realism. Perlman and Jones shine as Blue and Red and the fiery enchantress from the first movie, Liz, played by Selma Blair, is affecting and hot in all sorts of ways. You have to think that a woman who bursts into flames when she's pissed off and a fireproof demon are a match made in... well. Up there or down below. Whichever world del Toro throws up for our delight, the eye will never be short-changed even if the blockbuster rule book is strictly adhered to. For what it is, it's a bloody good example of delivering the goods.